Living in the pacific northwest, the opportunity to catch salmon is almost year round. On the odd number years the humpies run in huge numbers, so its quite easy to catch plenty of fish for the smoker. We used 20 humpy fillets with this recipe. They turned out excellent. Mix the spices and apple juice together until thoroughly combined. Put the fillets in the brine, then put the brine in the reefer or a cooler with ice in it. After 12 hours in the brine, remove and rinse each piece with cold water and pat dry. Place the fillets on racks skin side down to air dry in a cool place. When the flesh of the fish is slightly tacky, it’s ready to smoke. A small fan will speed up this process and help keep flies away. Arrange the fillets in the smoker skin side down leaving a little room between each one. Smoke the fish for 4 hours at 175 to 200 degrees. At this point they’re done the way I like my smoked fish. If it’s not done enough for your taste, give it another hour or so in the smoker until you get what you’re looking for. Then start eating, you’ll be amazed! Try the recipe above and get smoky! King Salmon is a favorite in the Great Pacific Northwest. 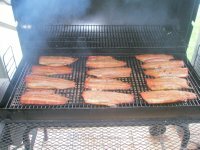 Return from smoked Pink Salmon to recipes. Return from smoked Pink Salmon to smoking meat.